← When should we question if our child is getting the right treatment? 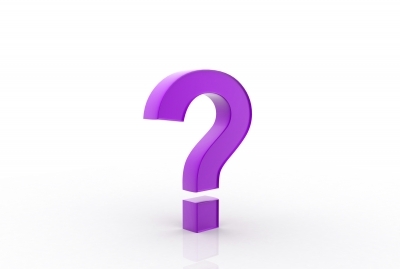 Welcome to the tenth and final installment of our Summer 2013 blog series…Ten Questions Parents and Caregivers Ask About Kids and Medication. Today, we’ll explore the most frequently asked question I receive from parents contemplating a recommendation for medication: If this were your kid, what would you do? This is the one question I’m asked most frequently from parents of the kids I treat, especially in situations where the complexity of the child’s problems is great and there’s no clearcut answer regarding the best treatment plan. My guess is that a surprising number of my colleagues in child and adolescent psychiatry would want their kids treated much more aggressively or much less aggressively than they typically treat their patients. I try to treat my patients the way I’d want my own kids treated, keeping in mind the differences in my risk tolerance compared to the family sitting in my office at any given time and the differences in my family’s ability (because of personal connections and financial resources) to access a range of alternative mental health and/or educational services. With that said, I’ll try to share some general answers to the “If this were your kid” question pertaining to medication on the basis of diagnosis and clinical presentation. If my kid had significant difficulty academically resulting from straightforward ADHD, I would have no reservation about starting them on medication. I would probably want to see them started on a long-acting amphetamine-based stimulant (either Adderall XR or Vyvanse), depending upon the length of time medication coverage was needed, because I would argue the presence of a small efficacy advantage of the amphetamine-based stimulants compared to the methylphenidate-based stimulants (see figure above). 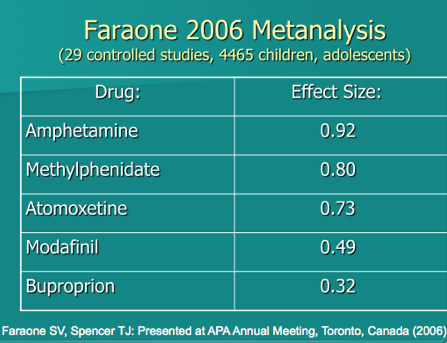 If they had some comorbid problem (anxiety, tics) along with ADHD, I’d want to make sure they were getting every appropriate educational accommodation prior to a conservative trial of stimulant medication, starting with a methylphenidate-based product if they had an issue with tics. If they were struggling with symptoms of an anxiety disorder, I’d want them to have a trial of cognitive-behavioral therapy from a highly skilled clinician before considering medication. Kids can pick and choose when they use the skills learned from CBT…they can’t turn off the side effects associated with a serotonin reuptake inhibitor. I’d do the medication along with CBT if their functional impairment was severe…if they were unable to attend school, or experienced significant difficulties with sleeping, eating, memory or concentration as a result of anxiety. I’d take the exact same approach if they had depression, especially if they experienced persistent suicidal thoughts or suicidal thoughts with an actionable plan to harm themselves. 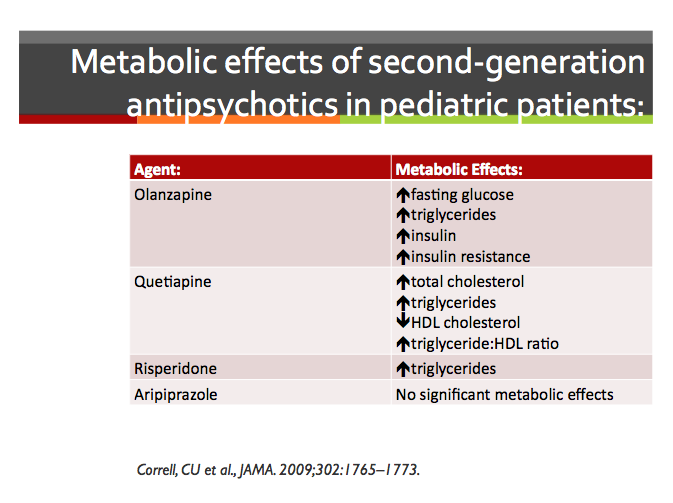 If they were in the midst of an unequivocal manic episode qualifying for a diagnosis of bipolar disorder, I’d want them to be started on aripiprazole…while hardly weight-neutral, it appears to be the most benign medication approved for treatment of pediatric bipolar disorder from a metabolic perspective with demonstrable efficacy. If they had a tic disorder, I’d likely do nothing, or consider a central-acting alpha adrenergic agent (guanfacine). The problems caused by many of the medications used to treat tic disorders are worse than the tics themselves. If my kid had a problem with aggressive behavior, I’d want them to have the best possible assessment prior to initiating treatment. If they were found to have a specific condition that contributed to their aggression, I’d treat that condition. I’d look at available resources for behavioral therapy or cognitive-behavioral therapy. I would only consider an antipsychotic if my child’s aggression placed them at serious risk of harming other people or if being on an antipsychotic enabled them to continue to live with our family. There’s something else I’d want for them as well…I’d want them to have the opportunity to experience Christian community in a local church where they felt welcomed and accepted regardless of their emotions or capacity for self-control on any given day. I’d want them to have the opportunity to develop their gifts and talents through meaningful opportunities to serve other people and to serve the church. I’d want them to have relationships with spiritually mature adults outside of our family who would help reinforce the values my wife and I hope to instill in them and be available to them when situations arise when they need advice from someone other than their parents. I’d also want to be in a place where my wife and I could experience a sense of community and find support on the days when our child’s problems became overwhelming. Key Ministry seeks to develop resources including this blog series, resources available through our website, live training, and our Inclusion Fusion Web Summit because we believe the church can be a great blessing and support to families of kids impacted by mental illness once the leaders of the church and the people who make up the church better understand the need. I’d ask any of you who found this series, or any other Key Ministry resource helpful to help us by sharing our resources with anyone in the church with a heart for sharing the love of Christ with kids or families impacted by mental illness who very much need to experience Christ’s love. 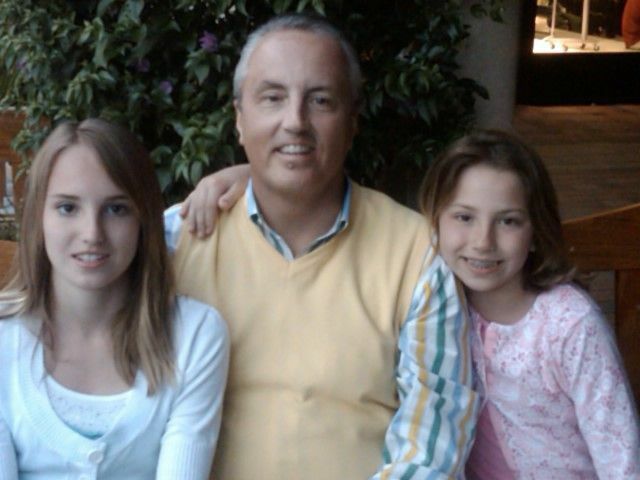 Those are my kids in the picture above, taken by my wife during Spring Break 2009 in Boca Raton, Florida. They’ve grown up a little in the last four years. Why does it seem so many kids are on medication? How would I know if my child would benefit from medication? What type of evaluation should a child receive before starting medication? Who’s qualified to prescribe medication for my child? When should parents consider non-medical treatment first? How well should medication work for my child’s condition? Are the medications prescribed to kids and teens with mental illness safe? How long will my child need medication? This entry was posted in ADHD, Anxiety Disorders, Bipolar Disorder, Controversies, Depression, Families, Hidden Disabilities, Key Ministry, Mental Health and tagged ADHD, aggression, anxiety, Bipolar Disorder, child psychiatry, church, cognitive-behavioral therapy, Depression, if this were your kid, Inclusion, Key Ministry, medication, tic disorders. Bookmark the permalink.